66 registered members (Adam M.), 377 guests, and 792 spiders. OK, everyone, it's time to disassemble your forks and make some measurements. Plate 7, 'Front Fork and Fittings', of the DBD parts manual shows different R and L 'fork sliding tubes' (i.e. the lower legs), different 'fork front shafts' (i.e. the main tubes), and different 'fork bottom yokes' for Scrambles and Clubman. There are a few other minor items but these are the major differences. So, the question is, exactly what are these differences? Different lengths, brackets, or what? To get things started, at first glance the two tubes in the photograph seem like they might be identical, but the tube next to the tape measure has four 0.152"-dia. holes located 1-3/8" from the bottom while the other one doesn't. Note that both of these came from a horde of BSA singles parts that I acquired so neither may be from a Gold Star, but what I'd like to establish is information allowing Gold Star parts to be distinguished from lesser BSA models, and Scrambles from Clubmans. The part numbers show that much remained the same from the BB through the DBD (and perhaps from the ZB, although I have added those part numbers yet). But, what I/we would like to know is what is the physical difference between a, say, 89-5061 and a 42-5027 fork shaft? And the same question for the other components. 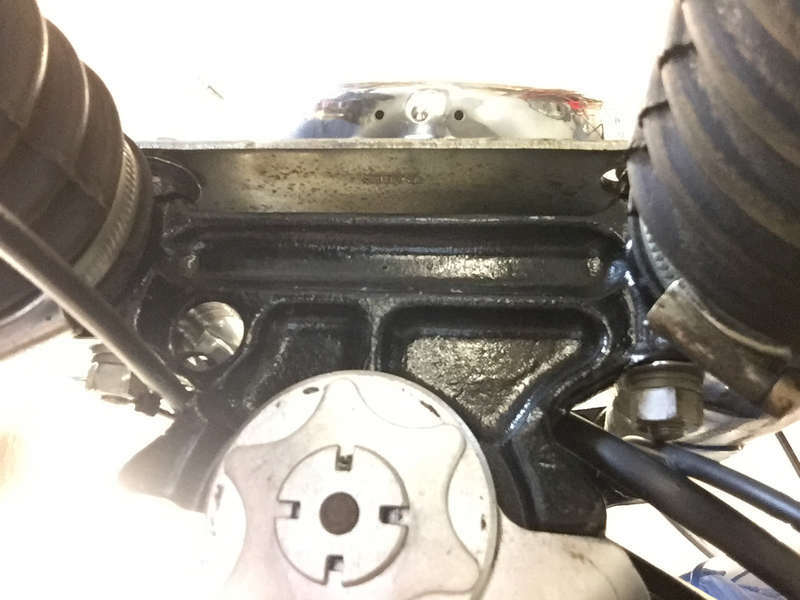 As can be seen the DBD Scrambles bottom yoke is shared with the lowly B31. Fair enough, but although the part numbers for both sliding tubes are also the same as for the B31, we know that Gold Stars had forgings for their mudguard stay bracket so they should have different part numbers. This is another mystery to solve. 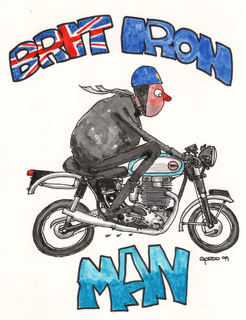 So, especially those of you with genuine, verified Clubmans, please go to the garage now, disassemble your forks, make the necessary photographs and measurements on the above four components, and report your findings. The tube with the holes around the bottom looks like 68-5144 used on some B44 and A50/65 machines in the 60s with rod dampers. The parts books do not show the holes. The early forks with the plug at the bottom of the slider had much smaller holes. This is what the end of 42-5027 looks like and it is about 22 1/2 inches long. 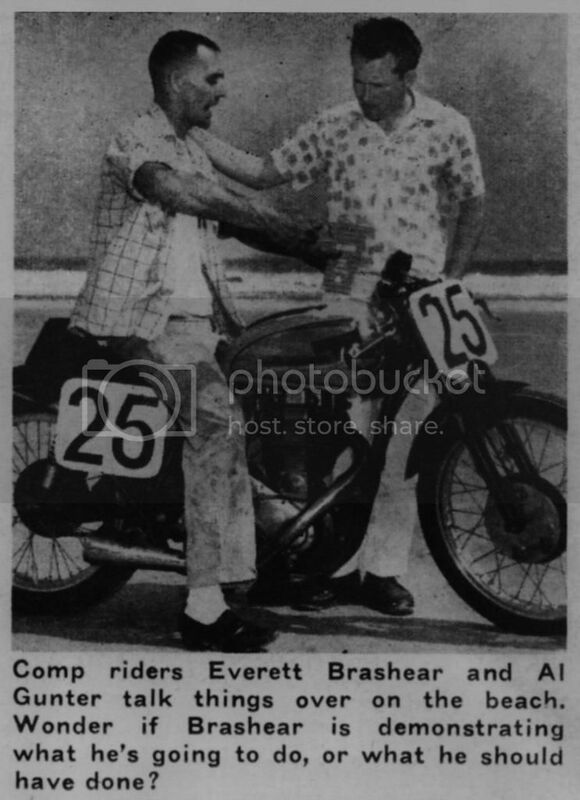 I think the similar Ariel staunchions were about 1" longer than BSA A/B range ones. I used a pair on my trials special X/C 350 mix(XB sub-frame, C group diamond and yokes,front brake, ZB32GS engine, B44 tank. I could see daylight thru the Chequered Flag so I rode another lap. Gordo plus 1, the stanchions are a minefield as the yokes and fork slider dimensions where they touch the stanchions are common to so many models. 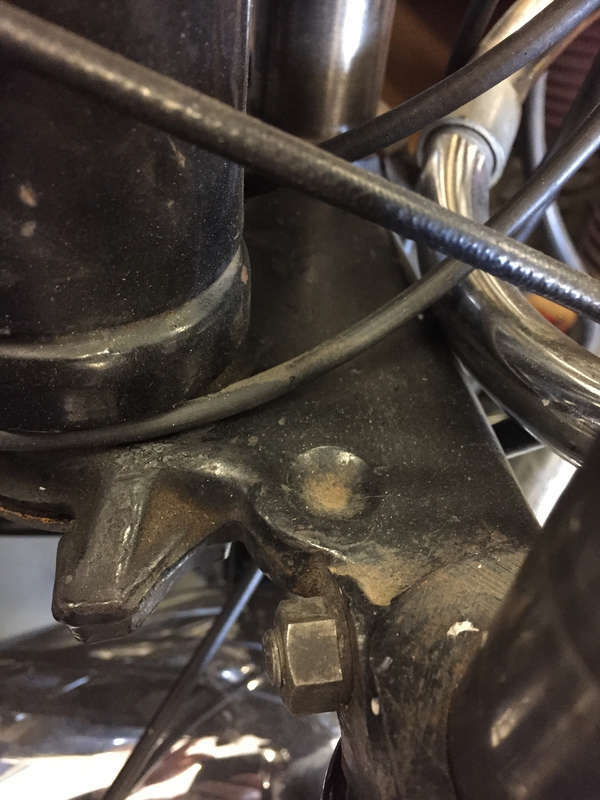 With the stanchions being a wear item and there being periodic shortages the scope for dealers listing the wrong item or owners fitting the wrong item to get a bike back on the road is rife. This is an exercise best done from the blueprints on the stanchions, going by what is fitted is not 100% reliable. Why the bigger holes in the later 2 way damped stanchions. 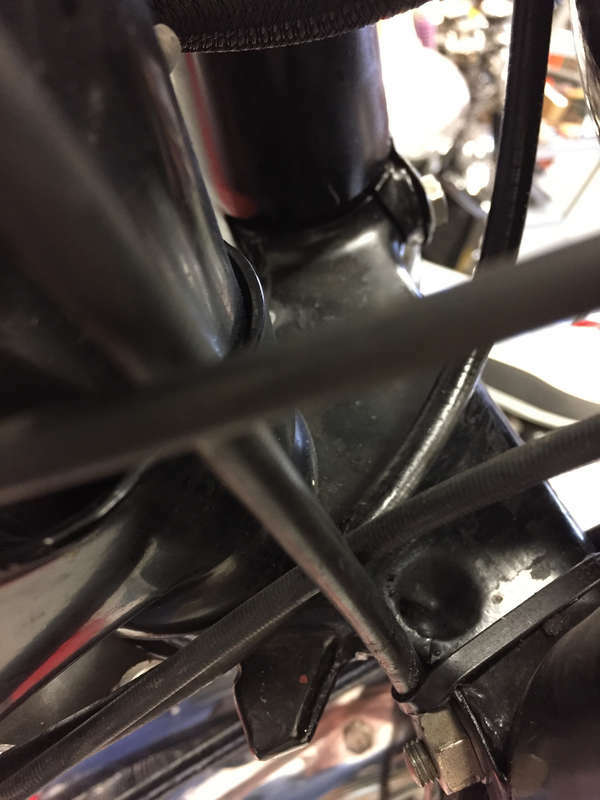 Original BSA heavy weight forks have single rate damping, this is provided by the holes in the stanchions which feed the gap between the upper and lower bushes. This damping rate is constant regardless of direction but its effect is not ideal as in compression it is supplemented by the springs being compressed and in rebound it is negated. The 2 sets of holes at different heights is a form of anti top out, the damping is increased when the higher set of holes is covered by the top bush and so the damping increases slowing the fork movement as the forks extend, then as the final set are covered close to full extension a full hydraulic cushion is created and the annoying clunk when you put the bike on the centre stand is eliminated. The rod damper is 2 way damping, a valve moves between 2 positions depending on direction of travel, the rebound damping is higher than the compression damping so the effect of the spring is balanced. 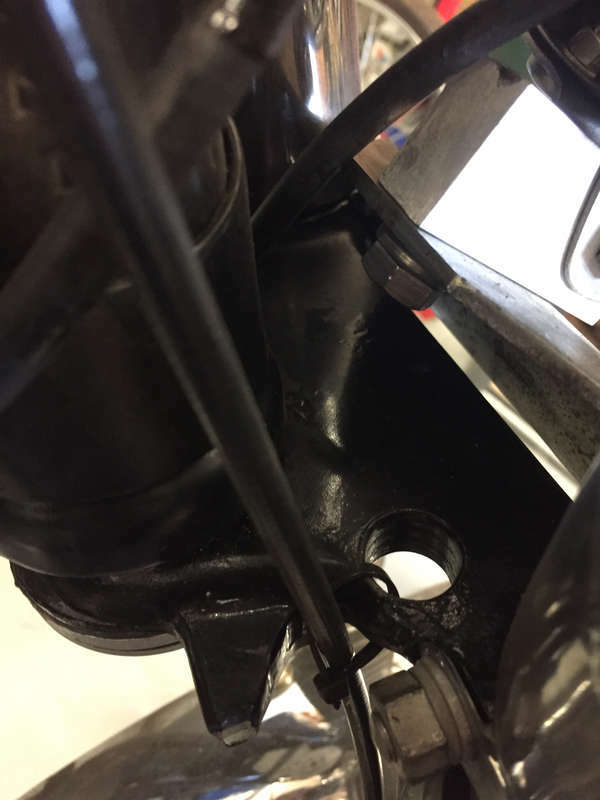 When BSA added the 2 way damping they opened out the holes in the stanchion so the damping provided by these holes was reduced and instead the main damping was provided by the rod damper. Fitted a rod damper stanchion to an earlier no rod damper fork will reduce the damping effect from standard. If you fit the Eddie Dow 2 way dampers, which are a different form of 2 way damper, then after testing you find the overall damping too high then you can adjust the damping by either going to a thinner oil or by opening out the holes in the stanchion. The latter option will increase the difference between the 2 damping rates, a thinner oil will effect both equally so some tuning between oil hole size and oil viscosity can be used to tune the damping. IME with the Dow dampers, 7.5W fork/shock oil got the dampening quite nice in both directions without modifying the stanchion holes or the damper rod holes. The later rod dampers need to have good internals to work their best. The little lobed valve gets worn, the damper tube can get worn mid stroke, the top guide bushing for the rod can get worn. Some of these parts can be hard to find. I do have some NOS damper valves if anyone wants dimensions. You can also stagger the bottom holes to affect top out of the forks with the rod damper forks. Seal off 2 holes by whatever method you prefer, redrill the 2 holes 1/2” higher. The tube with the holes around the bottom looks like 68-5144 used on some B44 and A50/65 machines in the 60s with rod dampers. Thanks for that information. It's most helpful. If it's not too much trouble could you measure the diameter of those holes, and their heights above the bottom end of the tube? Since the length is the same as the three tubes I presently have on the garage floor it well could be that the difference between Scrambles and Clubmans is in those oil holes. the stanchions are a minefield ... This is an exercise best done from the blueprints on the stanchions, going by what is fitted is not 100% reliable. Yes, but if only those blueprints were available. I'm afraid we're going to have to struggle through this with what people can find with their own forks even though that will sometimes result in false information to confuse matters. Although there are many differences in part numbers between Scrambles and Clubmans, a high fraction of them are cosmetic and easily spotted (although, not always). Others are functional, but readily apparent (e.g. 7" vs. 8" brakes, or Monobloc vs. GP). While we have a pretty good understanding of the differences between the other functional components on Gold Stars, the forks are a mystery remaining to be solved. The tubes are hidden, but it would be very useful if a few of you who know (or think you know) you have genuine Clubmans would photograph your bottom yokes and L and R lower fork legs from several angles and post the photographs. I'll do the same for the (presumably) Scrambles forks I have. With luck, the differences may be apparent when we compare the photographs. To get things started, the first two photographs are of the lower yoke on my 1963 Special Competition and the next two are on my 1962 Catalina. An obvious difference is the 'dimple' on the R side of the yoke has been drilled on the Catalina (although that could have been done after leaving the factory; more photographs of other bikes are needed to know). Note that L & R are reversed in the photos taken of the bottoms of the yokes. These are the photographs I could quickly take with the bikes trapped in their current locations. I'll take additional ones, and also of the lower fork legs, later when I've moved them. However, it might be that these are good enough to spot Scrambler vs. Clubmans differences, so please load the Kodachrome and take some photographs. This is why we are detectives and historians, as well as enthusiasts and restorers. 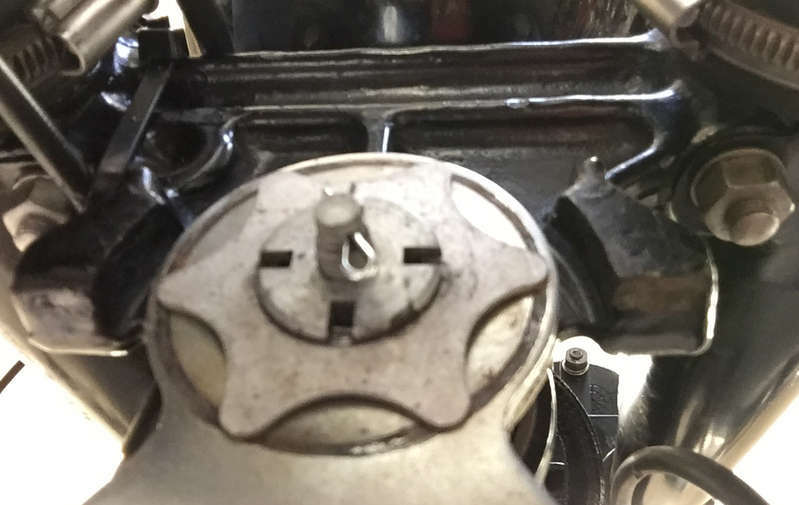 Don't know if this helps or just muddies the water further but if you look at the spares list for BSA A65's from 62 to 65 the lower yolks (part no 42-8056) clearly have a hole drilled on similar to the one on your Catalina, so I would say this is an original feature on your bike. My 68 A65 has the dimple similar to your competition special but I have no idea what its purpose was. Thanks. Information like this is valuable as we try to determine what's what. I've only taken the time to take two more photos today because I've been busy writing something that a colleague thinks is overdue but which isn't, really. 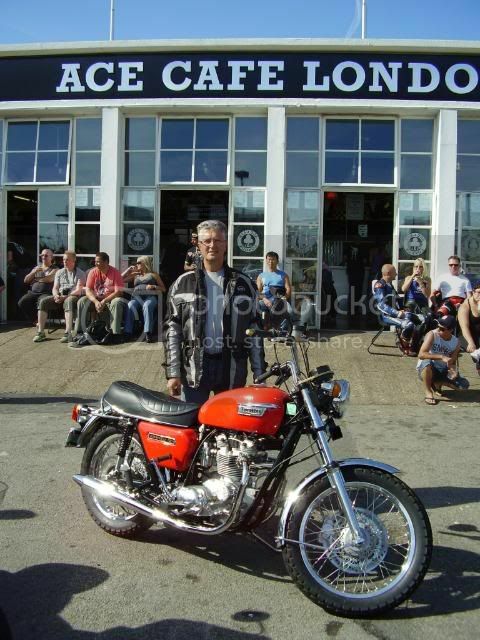 If the forks on my BB are original, then the lower yoke in the photographs below should be the same as the Scrambles. Complicating all of this is the Special Competition and Catalina are U.S.-only models so the forks aren't necessarily the same as listed in the DBD parts catalog. Illustrating this point, BSA Parts Service Bulletin No. N.9 of August 1963 lists 42-5016 as the bottom yoke on West Coast Clubman. The same bulletin lists the parts for the West Coast Competition model "As standard Clubman specification except for the following:" Presumably, this means standard West Coast Clubman, not standard UK Clubman. In which case, since it isn't on the list of exceptions, this means the lower yoke in my previous post probably is 42-5016. It remains for us to determine how this differs from 42-5015. OK, this is getting complicated, but nobody said it was going to be easy. MM: The 42-5027 mentioned above have just the two holes, one is 35mm from the end and the other is 79mm from the end. The holes are 3/32 inches. The other set 68-5144 has 4 holes all 35mm from the end. They are 5/32 inch holes. This is what I've found in the last few years examining the parts and researching parts books. I can verify when I get back to the shop. Pre unit oil holes are vertical and unit are radial. Fork legs 65-5410/5408 scr have the lug locator forging (Lower R/S) for the 7" hub brake plate and the L/S is different to accommodate the 7" hub axle. This is what I've found in the last few years examining the parts and researching parts books. Fantastic! This information removes a lot of unknowns. Thanks very much. Thanks very much for this. It could help a lot when determining differences between the various fork tubes. It's useful to look at the part numbers for the complete fork assemblies. 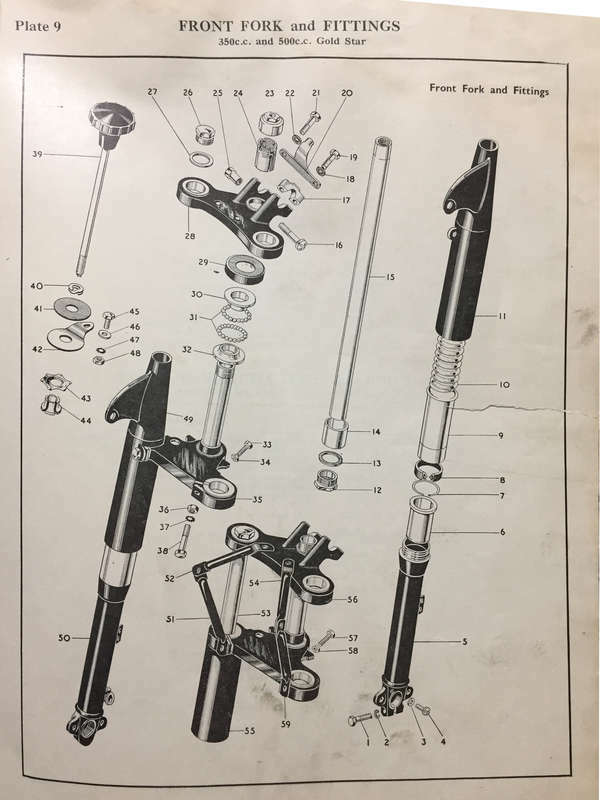 Note that Plate 9 of the 1954 BB/CB catalog shows two part numbers for the Clubman & Road Racing models, one with "2 piece handlebar," and the illustration shows two configurations, one that is suitable for clip-ons. Although Plate 9 shows steering lock stop bolts for both configurations (nb. 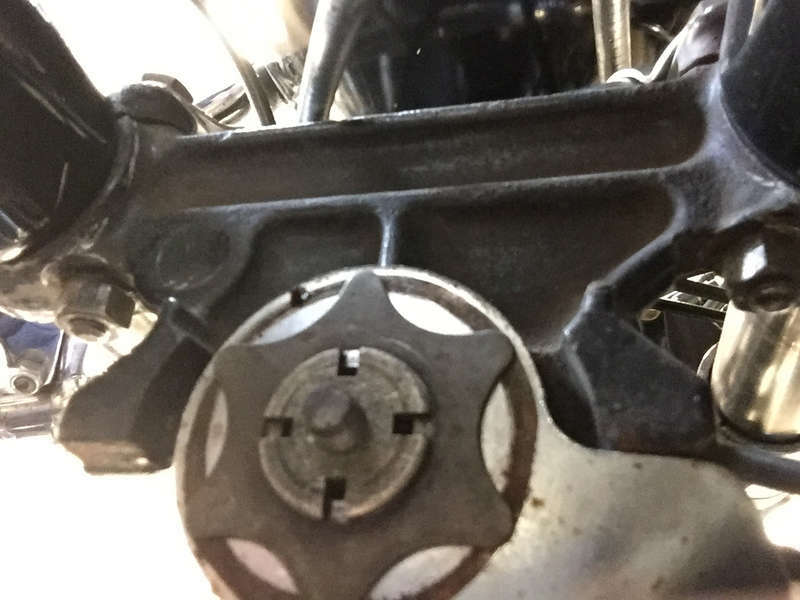 although they are 33 and 57 on the plate, both are listed as part number 2-204) there are different part numbers for the complete assemblies for the Trials/Scrambles and the Road Racing/Clubmans so the drawing isn't necessarily inconsistent with BritTwit's finding that the bottom yoke of the Trials/Scrambles isn't drilled for that bolt. out which springs you have fitted now and decide if you wish to replace them with the same or a different spring. As 67-5036/65-5391 look extremely similar there must be some change, overall diameter or a material change. Do we know the relationship with your yoke part numbers and the casting numbers (where there are any)? Is it one different? For interest I am looking at my stocks and of course the casting number and features of the bits is all I can go by. Tops are 65 5355, ?? 5011, 65 5365, 42 5035, 68 5120. For bottoms 42 5013 is the only number I have. The rest have no numbers so it needs to be the features, shape. Do we know the relationship with your yoke part numbers and the casting numbers (where there are any)? I didn't notice any casting numbers on the few yokes that I did look at, but I'll have to look again. We'll have to see if the N+1 rule applies since the same casting probably was used as the basis for more than one part number. Again I do not know how much this will help or hinder ????? Interestingly, BSA Parts Service Bulletin G2 dated October 1957 shows 65-5390, 10-3/8" - 10-1/2" free length, 7-1/8" compressed length, 84-88 lbs. load for the springs in Gold Stars and 75-5301, 11-1/2 - 11-5/8" free length, 7" compressed length, 170-178 lbs load for the springs in A-group machines. It's hard at first to know what to make of BSA's column for "load" vs. an actual spring rate. In a very loose sense 170 lbs. is half the weight of an A10 (without rider), but 84 lbs. certainly isn't half the weight of a Gold Star. Also, the same bulletin gives 170 lbs. for the load on a D1's springs so the figure must be the preload. Note that for the Gold Star 10-3/8" minus 7-1/8" is 3-1/4" and that times the 29 lbs/in from the Draganfly catalog is 94 lbs. which is in the ballbark of BSA's 84-88 lbs., and for an A10 11-1/2" minus 7" is 4-1/2" and that times the 34 lbs/in from the Draganfly catalog is 153 lbs., which again in the ballpark of BSA's 170-178 lbs. So, "load" in the Parts Service Bulletin must be the preload on the springs. As can be seen, it's quite different for these two bikes. Right side approx. 1/2" hole vs. dimple. "SWING ARM BOTTOM YOKES" ??? Maybe as compared to the earlier rigid and plunger frame yokes. The bottoms are quite different due to the different steering stop plate setup. Taking breaks yesterday from my current writing task, I laid out the bottom yokes and fork legs from my stash. Not all are from Gold Stars (e.g. one yoke is actually marked 'M21' with a paint pen), but there are enough similarities and differences to make this thread worthwhile as try to get to the, um, bottom of this. More will follow, after I'm free from my current yoke of oppression. Magnetoman, when this is all sorted out, will you be releasing a revised, updated edition of your book?